As an aspiring ecologist, I am well aware that publishing a paper in Nature or Science would give my career an incredible kick-start. 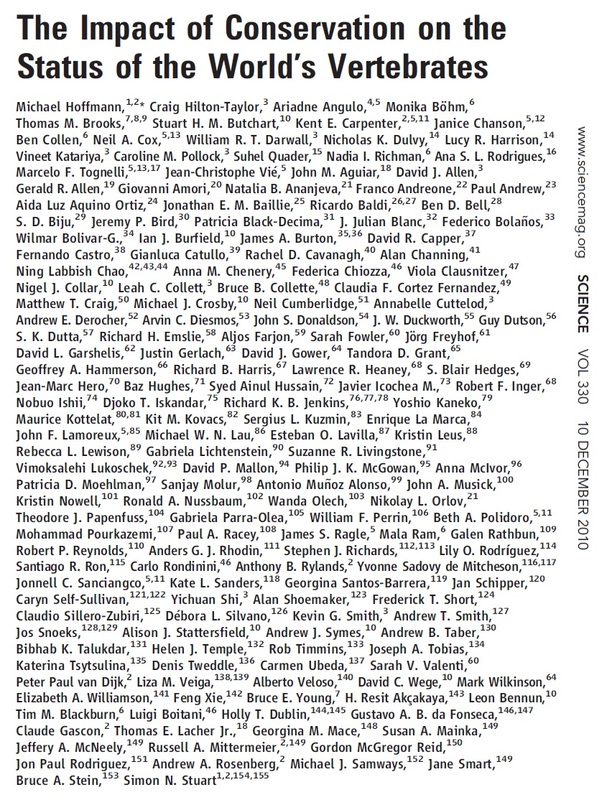 But, like so many others, I didn’t know how to get my name printed on the glossy pages of the two oldest and most prestigious weekly scientific journals. So I did what any good scientist would do – no, this time I didn’t check Wikipedia – I knuckled down and poured over the pages in these celebrated periodicals. I spent countless nights without sleep, trying to crack the code. Just as I was about to give up, I saw a glimmer of hope: a golden thread linking the fortunate submissions to these two behemoths of academic excellence. I managed to reverse-engineer the path to success and I will be so generous to share my astounding findings with you. But before I do that, a word of warning: my how-to guide only applies to ecological studies. Physicists, physiologists and… um… uh… anyone else (I ran out of alliterative scientific sub-fields) will have to find their own strategies. If you want know whether conservation has improved the state of vertebrate biodiversity over the past 30 years or are just curious how many insects live in half a hectare of Panamanian rainforest, you’ll need good data to get in Nature or Science. But exactly how good should your data be? Fortunately, others have already answered this question. As a rule of thumb, imagine a good set of data and then multiply that by a million! Michael Hoffman and a team of 175 experts compiled a monster database on the threatened status of 25 780 species (I can imagine the reluctant editors at Science debating whether it was worth dedicating an entire precious page just to accommodate all the author affiliations). They concluded that biodiversity is declining really quickly but it would be much faster if there wasn’t any conservation. You too can produce wonderful papers if you can afford to pay the salaries of enough world-leading scientists to fill more than 11 rugby teams! Of course a massive, global-scale assessment isn’t something the average PhD student can hammer together in 3 years. Sometimes you have to start small. Yves Bassett enlisted the help of a completely reasonable team of just 38 other specialists to count the number of insects creeping and crawling in 0.48 ha of tropical forest. That is a tiny area! Barely the size of a rugby field (yes, yes, I’ll try my best to dial down the rugger-references). Sounds simple enough, right? Think again! They found 129 494 arthropods from 6 144 species. Researchers constructed a 52 m crane in the middle of the jungle, dangled from giant helium balloons and hired helicopters just so that they could reach the towering tree canopy. Let’s not forget the hours spent sorting and identifying specimens. So, if you can herd a team of brilliant minds while spending fortunes to do preposterous things in the pursuit of data, you will be well on you way to seeing you name in print. Sometimes in science, it’s less about what you say than it is about how you say it. So how did it get into the exclusive pages of Science? 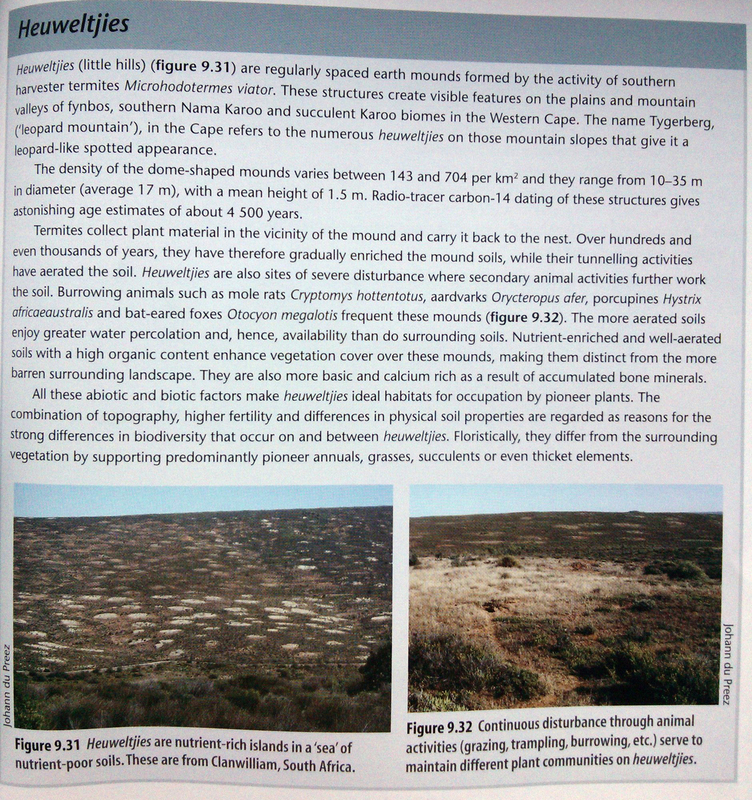 Maybe it was because these phenomena, which are known locally by the mundane term heuweltjies (“little hills” in Afrikaans), were called fairy circles in the paper. Seriously, who can resist a fun narrative? Although channelling J.R.R. Tolkien won’t necessarily get your next paper accepted in Nature or Science, a bit of colourful storytelling certainly won’t harm your chances. Many great scientists with stellar careers have never had their work accepted in Nature or Science. Others just strike gold with a bit of good fortune. My favourite example is this paper on the discovery of a new nematode species in a mineshaft 3.5 km below the surface of the earth. How do I know that this miraculous discovery was blind luck? Well, this little worm, the deepest known multicellular organism, was discovered by biochemists from my Alma Mater, the University of the Free State. Yes… biochemists. The researchers were busy studying the enzymes and proteins in these extreme environments (which could have applications for bioremediation) and stumbled across the phenomenal beast. With the help of a Belgian nematologist, this new species was unveiled to the world little over two years ago. Of course, credit where it’s due, the discovery was contingent on them being miles deep in an underground tunnel, but to accidentally find something that spectacular is incredibly lucky. It’s equivalent to tossing a fishing line in a puddle of water and reeling out a whale (although the fisherman would also argue that he did cast his line in that puddle; effectively making his own luck). This is an example of telling a good story (See Step 2). While the discovery is certainly spectacular, it hardly qualifies as something from the Hitchhikers’ Guide to the Galaxy! Some argue that there is just a fine line between genius and insanity. If you want to make it into Nature or Science then you should be prepared to tip-toe along that line. It might be an unconventional, but completely plausible, suggestion to reduce the rhinoceros poaching crisis by legalising the trade in rhino horn. Or you could move closer to the edge of normalcy by suggesting that conservation biologists demonstrate unnecessary prejudice towards exotic species. Alternatively, you can embrace the preposterous and propose the introduction of African elephants as a solution to fire management in Australia! Whichever path you choose to follow, remember that it is always a good idea to provoke a reaction from the readership by offering a different point-of-view. If you’ve read a recent paper published in one of the glossy giants that goes against the grain of your own beliefs (which, considering Step 4, is very likely), don’t hesitate to write a technical comment in response to that paper. Everyone loves passive-aggressive one-upmanship; or as it is euphemistically known: scientific dialogue. Maybe you should accept that the only way to see your name in print is by riding on the coattails of other researchers. Or, if you really have no shame and will do anything to get into either Nature or Science, you can always write a letter to the editor or take part in a reader survey. But let’s face it, you’ll have to have a huge ego and zero humility to stoop so low as to sneak into those prestigious pages through such a non-scientific avenue! I still haven’t decided whether this post is a satire with sprinkles of truth or an instruction manual with a decent dose of sarcasm. Take it as you wish. If you are an editor at one of the monuments to magnificent manuscript, however, please consider this post as a lame attempt at flattery. I’d hate to be in your bad books if one of my papers happens to cross your desk some day! This entry was posted in Academia, Funny, Research, Satire and tagged Academia, Careers, Ecology, Nature, Publishing, science. Bookmark the permalink. Excellent, and like the best satire, with more than a bit of truth. I’ve used both #5 a and the shameless b. First as a postdoc and second author on a technical comment in Science demolishing a raft of crappy food web models based on mindless mining of published “food webs” (there’s one you missed – develop a simplistic model and shamelessly flog it as the answer to an ‘important’ question). Although we were absolutely correct, after more than 30 years, the technical comment has only 20 citations on Web of Science and brain-dead assumptions such that omnivory destabilizes models so it should be rare in nature still abound. Many of my taxonomic papers have more citations over a shorter time frame. Second, as an established scientist I let some of my European colleagues drag me into a Letter to the Editor of Nature about how loss of taxonomic skill is inhibiting research into soil biodiversity. If anyone not an author has cited that, I would be surprised. You missed one other way of getting into the big glossies – corner the market on images of a strange group of organisms and they will hunt you down. I’ve had at least three of my images published in Science (twice in the web news section and once for Bill Hamilton’s obituary) and had full page spreads in less prestigious journals like Current Biology and a cover of Trends in Ecology & Evolution. I’m still hoping that one day I’ll stumble across a #2 or 3. I’ve always enjoyed papers by the likes of Tom Eisner and Rich Palmer even when published in Science or Nature. It’s funny how scientists have such a love/hate relationship with Nature and Science. We all know that paper published there are, on average, no better than most papers in other decent journals, yet most of us would still walk over hot coals to see our name on those glossy pages. I never thought about providing images for these big journals. But I wouldn’t necessarily consider that as a sneaky way to get your work published because it involves a lot of hard work (finding those odd critters) and skill (taking decent photos). While publishing images won’t boost your CV and get you promoted, it is still a valuable scientific contribution (unlike a lot of the stale editorials and fruitless back-and-forth “debate” in the correspondence sections of the Big Two). This is only slightly related, but you might find it interesting: The Games Ecologists Play. Thanks Rachel, it’s flattering that you considered my blog for the award. I really appreciate it. * To anyone else: Go ahead, click through to Rachel’s redesigned site. Not only does it have a beautiful layout, it also has great information and interesting guest posts!